PG&E Vice President and new UC Merced Foundation Board of Trustees member Kevin Dasso (right) presents Board of Trustees Chair Mike Gallo with a check at a ceremony celebrating the award to SNRI. A team of UC Merced researchers was recently awarded $100,000 from Pacific Gas and Electric Company (PG&E) to identify ways to improve drought resilience and reduce the risk of wildfire in Sierra Nevada forests. 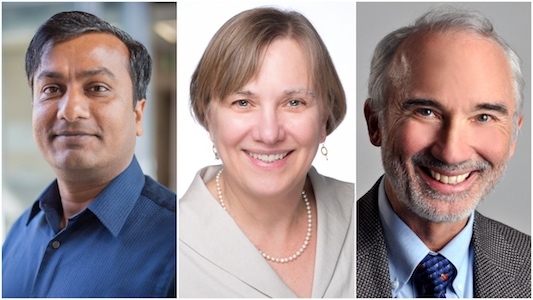 Professor Roger Bales, who also serves as director of the Sierra Nevada Research Institute (SNRI), Professor Martha Conklin and SNRI Research Scientist Mohammad Safeeq will develop new approaches to accelerate the pace and scale of forest restoration in Calaveras County. "Research supported by this PG&E grant will provide land managers with a much-needed understanding of the forest-water-fire nexus. It will also provide the tools needed to increase forest resiliency in the Sierra Nevada,” said Safeeq, who also served as the proposal’s primary author. Mohammad Safeeq (left), Martha Conklin (center) and Roger Bales. Bales, Conklin and Safeeq will expand upon studies of the recent California drought and develop new tools to assess drought vulnerability and the resilience of forested areas. They’ll collaborate with local land managers and stakeholders to test and refine these tools in central Sierra forests, then communicate their findings to the public to engage broader support for investment in forests. 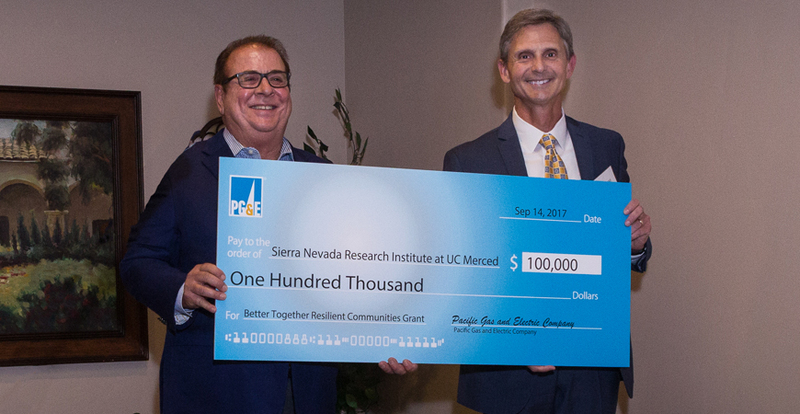 UC Merced was one of two institutions selected to receive funding from PG&E’s Better Together Resilient Communities grant program in its inaugural year. The Karuk Tribe of California was also awarded $100,000 to develop a plan for addressing critical infrastructure needs and protections to implement prescribed burns in Humboldt County. The two proposals were selected from a competitive pool of 37 applications after a thorough review by an advisory panel of community leaders and sustainability experts. Safeeq and Conklin are featured in UCTV's "Water in the Balance," a five-minute tour of California’s water system and its challenges. “These grants are about funding innovative ideas for helping those who live in highly vulnerable areas prepare for the reality of climate change. We believe that drawing on the expertise and established partnerships of these local organizations is the best way to find effective solutions to an urgent problem,” said Geisha Williams, CEO and President of PG&E Corporation. The program will invest $1 million over five years to fund local initiatives that improve climate resilience throughout Northern and Central California, focusing in its first year on forest resilience, wildfire prevention and sustainable watersheds.